The political climate in which the McMahon Act passed was one of overwhelming American superiority. While the British feared a second postwar retreat into isolationism, Americans enjoyed a position of global dominance unparalleled in world history. Senator Brien McMahon (D-CT) c. 1953. The numbers are telling: in 1945 the United States accounted for half of global GNP with $355.2 million, 46% of world electrical power, and controlled 59% of world oil reserves. Britain, its closest ally, was facing massive deficits and spending cuts. Geir Lundestad puts it bluntly: “Britain had a brilliant war record, but little else.” The American atomic monopoly only magnified the supremacy of the nation. 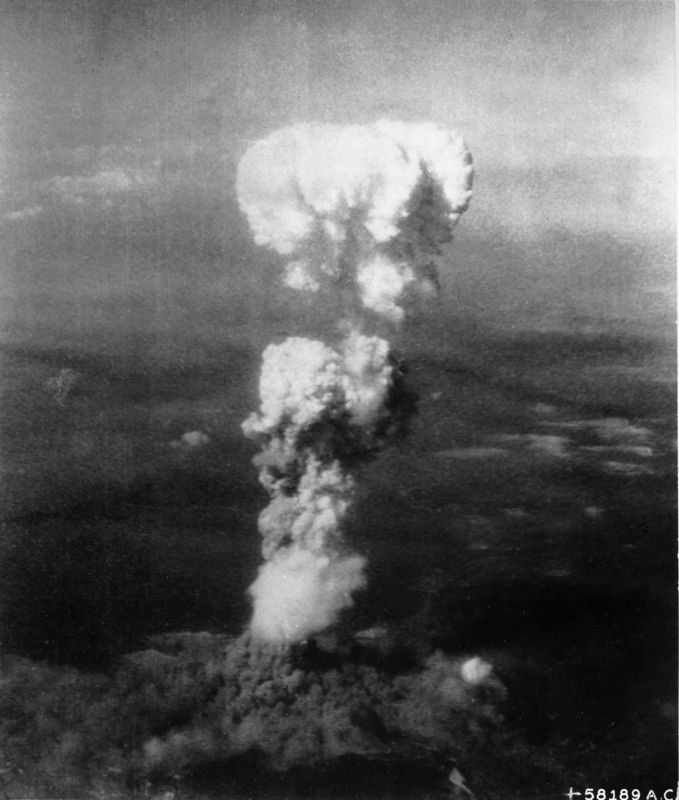 Once it became clear that Britain had the will and capability to develop nuclear weapons independently, the Americans wished to have as much control over their deployment and potential use as possible and to limit expenditure on them by the British government to the minimum so that the British could deploy more useful forms of military power [emphasis mine]. For America, Britain’s most useful contribution to the Cold War were English air force bases, from which American planes carrying American nuclear weapons could be launched. Marshal of the Royal Air Force Sir Arthur Tedder, c. 1945. Only four months after the last American B-17 bomber departed England, talks at the highest personal levels of the military had concluded there was a need for a permanent American nuclear presence. 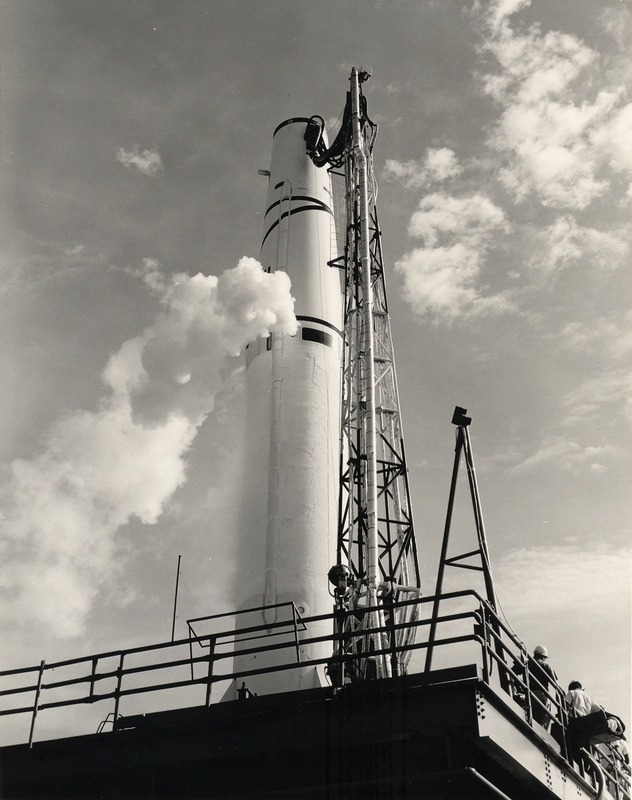 In July 1946 the head of the RAF, Air Chief Marshal Arthur Tedder, had agreed with American recommendations that “at least two bases should be prepared for handling the atomic bomb.” Construction moved rapidly under the supervision of USAF head Carl Spaatz, and in early 1947 there were functional nuclear assembly and loading facilities in Britain. The first Strategic Air Command units of B-3 and B-29 bombers arrived in July. With Britain assuming the dangers of both Soviet attack and nuclear accident, and yet missing out on any benefits in the area of atomic research, it seemed as though relations between the two were at their nadir. This was not the case. The Spaatz-Tedder talks that laid the foundation for American forward air bases in England were only one example of the continuing close relations that the American and British military establishments enjoyed. While the civilian relationships – Attlee and Truman, Bevin and Acheson – floundered, the members of the former Combined Joint Chiefs of Staff maintained their ties. If Soviet Russia is to be denied the hegemony of Europe, the United Kingdom must continue in existence as the principal power in Western Europe economically and militarily. The US should, therefore, explore its relationship with Great Britain and give all feasible political, economic, and if necessary, military support…to the United Kingdom. The divide, therefore, was not one of public approval so much as it was yet another struggle between the legislature and executive branches to determine American foreign policy. Cooling tower and Reactor No. 4 of the Calder Hall nuclear power station (construction began in 1953) at Sellafield in Cumbria, England. Furthermore, and to a greater extent than the bombs themselves, the power facilities built in England were better than the “clumsy, hastily built” reactors of the Americans; with plenty of time to develop and redesign new power plants, British atomic program had an opportunity to demonstrate its skill. This was not an impossible – though certainly a significant – drain on British resources. Despite the restrictions of the McMahon Act, an agreement was reached on an equal division of uranium ore, and joint monitoring of atomic testing continued. Certain events of the late 1940s and early 50s brought the issue back to the forefront. The 1948 Berlin Airlift was a stark reminder that Britain was under direct threat of attack during a nuclear war. It also provided the pretext – though as Simon Duke is quick to point out, not the cause – for a massive return of American bombers to Britain. The majority of these were ‘atomic-capable’ by 1950, and while the gesture was seen as concrete evidence of an American commitment to Europe, the nuclear imbalance was troubling to some. Compounding this was the informality with which Britain agreed to base the American bombers. Their presence was based not on any treaty, but instead “under informal and longstanding arrangements between the two air-forces for visits of goodwill and training purposes.” This was to have later consequences, but in the meantime Britain was playing host to a capable nuclear deterrent. The outcome of the Berlin Crisis necessitated an American military buildup, and the confusion within the RAF and Ministry of Defense over the scale and duration of an American deployment precipitated their permanent arrival. The military ties were also solidified in the form of NATO, which was finally brought into existence in April 1949. That “healthy hanky-panky” between British and American officers that had been ongoing for years now had an official outlet, as well as an international mandate to continue collaborating as they had. Just three months after the crisis’ end in May 1949, the Soviet Union joined the nuclear club. 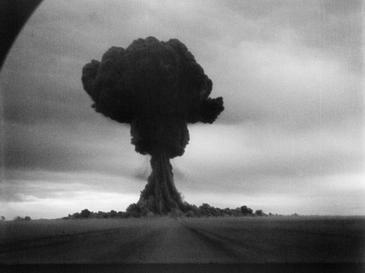 "Joe-1" (RDS-1), the first Soviet nuclear weapon test, 1949. The British Chiefs of Staff had foreseen the threat of atomic attack, but the portents were dire. A 1947 report read: “The advent of mass destruction weapons and long-range weapons has produced a situation in which methods of attack are far ahead of those of defence and enormous damage will be done to the dense and concentrated population and industries of the United Kingdom.” Unfortunately, their prescience had not extended to when the Soviets would acquire a bomb. They had assumed a British nuclear capability by that time. Clearly the program needed to be put in high gear. Berlin and the Soviet bomb were major developments in terms of American favorability towards a British bomb. The importance of keeping a nuclear deterrent on British soil was self-evident at this point, and even if there was grumbling in circles about the reliance on American bombs and the lack of an independent British deterrent, it was silenced by the chilling possibilities of nuclear war. More pragmatically, the new strategic picture was an opportunity to press the Americans for increased nuclear cooperation. Since 1946, it had been “a high priority for successive British governments to reestablish a close nuclear relationship with America.” Starting in 1953, writes Ball, “Eisenhower was willing to use the British government’s desire to have a close nuclear relationship with the United States to shape Anglo-American relations…as long as its own freedom of action was in no way impaired.” The freeze on joint nuclear planning began to thaw. When the McMahon Act was amended in 1951, it did not have a dramatic effect on Anglo-American atomic collaboration. It did have a symbolic effect. It allowed for limited transfers of fissile material, as well as restricted information relating to civilian power uses. As Baylis points out, the amendment was mostly beneficial to the United States, which was concurrently refusing to allow a British nuclear test using their facilities. By the time Washington had worked out an acceptable offer, London had already made the decision to hold its test in Australia for “political reasons.” Even so, some collaboration was restored at even an official level, while the implicit cooperation continued at more secretive levels. The blast from Operation Hurricane, the first British nuclear weapon test, 1952. Even after Britain’s first successful nuclear test in 1952, the United States remained skeptical. While supportive of deterrence theory, the Americans still believed that the best way for Britain to contribute to NATO and European defense was through conventional forces. There were adherents to this view even in Britain itself. Sir Henry Tizard believed that trying to add to the weight of SAC would be useless and insignificant, and that resources could be better spent elsewhere. The Chiefs of Staff, in turn, saw British nuclear capability as key to maintaining influence in the United States. Thus, the American test of a thermonuclear device set a new challenge for the British to match, along with a ballistic delivery system capable of hitting Soviet Russia. In 1954, the McMahon Act was further amended, allowing data-sharing on the specifications of the two allies’ various nuclear devices. Rebuffed at first, eventually the Chiefs of Staff succeeding in learning American nuclear strategy, and moved to adjust their plans accordingly. This may, as Ball suggests, have been American military officials humoring their British counterparts more than anything. As has so often been the case with the special relationship, though, as long as both parties are content, everyone has the upper hand. The United States sought to keep Great Britain satisfied through pieces of cooperation, restricted information, and technology. In 1957, by which point Harold Macmillan was serving as Prime Minister, the British detonated their own thermonuclear weapon, and the Eisenhower Administration was ready to move even closer to Macmillan’s government. The highlight of the Bermuda Conference was America’s offer of the Thor intermediate-range ballistic missile (IRBM), which would hurtle past Britain’s own research by five years. Not only were the delivery systems on the table; the RAF and the USAF were arranging for the latter’s possession of American nuclear weapons. The paranoia and aloofness that had characterized the Truman era was now absent from the American psyche. It had been replaced by a visceral fear of nuclear annihilation at the hands of the Soviet Union. The moment when nuclear collaboration finally came out of the shadows and into official acceptance began with the Soviet launching of Sputnik in 1957. More than the first atomic bombs, more even than the invention of thermonuclear weapons, the rocketry technology required to put a satellite in orbit now threatened every inch of the globe. Macmillan understood what ‘good luck’ he’d had with this turn of events. His nation had managed to develop and detonate a thermonuclear weapon of its own design, further proving British technological know-how in the field. The Thor IRBMs and American weapons were not something offered to every NATO member country. They were an exclusive benefit of the special relationship, and because both Britain and America had maintained their formal and informal liaisons throughout the McMahon Act years, Britain was able to capitalize on America’s offers – offers that the United States would not otherwise have been able to make. Macmillan followed the Bermuda Conference with a trip to Washington. President Eisenhower offered to repeal the McMahon Amendment, and 1958 marked a momentous year in the restoration of truly warm, close Anglo-American relations. In that one year, the McMahon Act was repealed through amendment of the 1954 Atomic Energy Act. A bilateral treaty, the US-UK Defense Agreement, was signed allowing for a full and unfettered transfer and exchange of nuclear information. By December, “the Americans had given Britain virtually complete details on how to make certain American thermonuclear weapons in the United Kingdom,” and also given thermonuclear weapons directly. 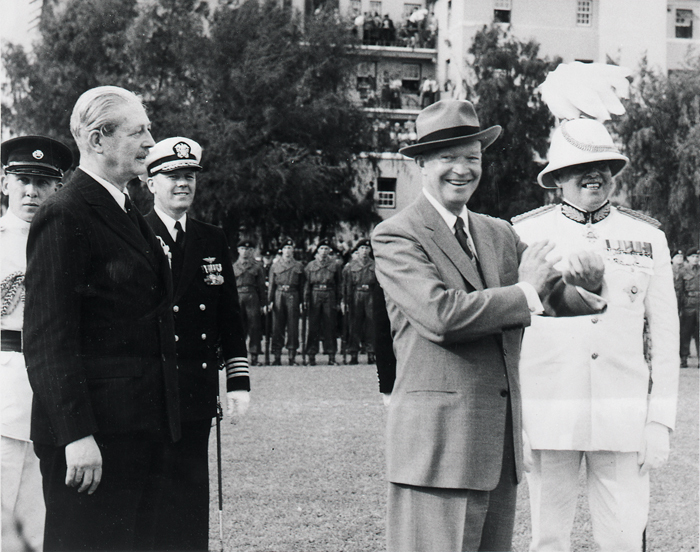 Macmillan and Eisenhower at the Bermuda Conference in Hamilton, March 1957. In becoming a full-fledged member of the nuclear club, writes Ball, “the military establishments of the United States and Britain had achieved what both sides wanted: a close partnership in nuclear weapons and planning for their use.” The McMahon Act did nothing to stop the process; it did almost that little to delay it. Instead, Anglo-American nuclear collaboration between 1946 and 1958 may have served to strengthen the ties of the special relationship. The onus during that period was put on individual relationships, and connections made during World War II. It was not an official policy, and indeed at times the United States appeared to be in violation of the spirit, if not the letter, of McMahon. Nevertheless, the act’s eventual repeal marked the start of a new chapter in transatlantic relations. Without the secret cooperation and disclosure of nuclear advances, the United States and the United Kingdom would have found each other much more intractable in terms of discussing strategy and coordination. The ability to keep relatively abreast of the other’s progress was to be of great benefit to NATO and the world in future struggles. Perhaps most important, though, is the evidence that the special relationship will defy an act of Congress and the signature of the president. The repeal of the McMahon Act in 1958 was the special relationship writ unto law. John Baylis, Anglo-American Defence Relations, 1939-1980: The Special Relationship (Basingstoke: Macmillan, 1981), 19-20. See, for example, Nicholas J. Wheeler, “British Nuclear Weapons and Anglo-American Relations, 1945-54,” International Affairs 62.1 (1986), 71-86; and Simon Duke, US Defence Bases in the United Kingdom: A Matter for Joint Decisions? (New York: St. Martin’s, 1986). Simon J. Ball, “Military Nuclear Relations between the United States and Great Britain under the Terms of the McMahon Act, 1946-1958,” The Historical Journal 38.2 (1995), 440. One could draw a direct parallel between the thinking of Whitehall and Foggy Bottom in this era. A 1944 Foreign Office paper compares the “enormous power” of America to “the power of the reservoir behind the dam, which may overflow useless, or be run through pipes to drive turbines. The transmutation of their power into useful forms, and its direction into advantageous channels, is our concern.” AN 1538/16/45, “The Essentials of an American Policy,” March 21 1944, Public Record Office, FO 371/38523, as quoted in John Baylis, Anglo-American Relations since 1939: The Enduring Alliance (Manchester: Manchester University Press, 1997), 35. Duke, US Defence Bases in the United Kingdom, 21-22. Foreign Relations of the United States, 1946, Vol. 1 (Washington, D.C.: Government Printing Office, 1972), 1170; as quoted in John Dumbrell, A Special Relationship: Anglo-American Relations from the Cold War to Iraq (Basingstoke: Palgrave Macmillan, 2006), 50-51. Baylis, Anglo-American Defence Relations, 26-29. Duke, US Defence Bases in the United Kingdom, 29. Quoted in Baylis, Anglo-American Defence Relations, 34. Duke, US Defence Bases in the United Kingdom, 33. Baylis, Anglo-American Defence Relations, 31, 33. Ball, “Anglo-American Nuclear Cooperation,” 441. Defe 5/6, COS (47) 227th Meeting, November 17 1947, as quoted in Wheeler, “British Nuclear Weapons and Anglo-American Relations,” 72-73. Ball, “Anglo-American Nuclear Cooperation,” 440. Baylis, Anglo-American Defence Relations, 49. Wheeler, “British Nuclear Weapons and Anglo-American Relations,” 78. Baylis, Anglo-American Defence Relations, 54. Sean Greenwood, Britain and the Cold War, 1945-91 (Basingstoke: Macmillan, 2000), 147. Ball, “Anglo-American Nuclear Cooperation,” 451. Greenwood, Britain and the Cold War, 148-49. Ball, “Anglo-American Nuclear Cooperation,” 452. Ball, “Anglo-American Nuclear Cooperation,” 453.